of notebook sales at Currys PC World, the largest electronics retailer in the U.K. So what’s next? Today we’re excited to announce our newest laptop—the Chromebook Pixel—which brings together the best in hardware, software and design to inspire the next generation of Chromebooks. With the Pixel, we set out to rethink all elements of a computer in order to design the best laptop possible, especially for power users who have fully embraced the cloud. The philosophy of Chrome has always been to minimize the “chrome” of the browser. In much the same way, the goal of the Pixel is to make the pixels disappear, giving people the best web experience. Let’s start with the screen. This Chromebook has the highest pixel density (239 pixels per inch) of any laptop screen on the market today. Packed with 4.3 million pixels, the display offers sharp text, vivid colors and extra-wide viewing angles. With a screen this rich and engaging, you want to reach out and touch it—so we added touch for a more immersive experience. Touch makes it simple and intuitive to do things like organize tabs, swipe through apps and edit photos with the tip of your finger. The Pixel has been engineered with the highest quality components to ensure it’s comfortable to use all day long and meets the needs of demanding power users. The body of the Pixel is made from an anodized aluminum alloy to create a smooth and durable surface; vents are hidden, screws are invisible and the stereo speakers are seamlessly tucked away beneath the backlit keyboard. The touchpad is made from etched glass, analyzed and honed using a laser microscope to ensure precise navigation. The Pixel also has powerful, full-range speakers for crisp sound, a 720p webcam for clear video, and a total of three microphones designed to cancel out surrounding noise. Speed: Speed has been a core tenet of Chrome and Chromebooks since the beginning. For Pixel, it’s critical that the overall experience, everything from loading webpages to switching between apps, is near instant. Powered by an Intel® Core i5 Processor and a solid state Flash memory architecture, the Pixel performs remarkably fast. Connectivity: The Pixel has an industry-leading WiFi range thanks to carefully positioned antennas and dual-band support. Long-term evolution (LTE) is engineered directly into the machine, delivering fast connectivity across Verizon's network, the largest, fastest 4G LTE network in the U.S. (LTE model optional). It also comes with 12 free GoGo® Inflight Internet passes for those times you need to connect while in the air. Storage: Since this Chromebook is for people who live in the cloud, one terabyte of Google Drive cloud storage* is included with the Pixel. This enables you to save, access and share photos, videos, documents, and all of your stuff from all of your devices, from anywhere. Finally, as you’ve come to expect from all Chromebooks, all of your favorite Google products like Search, Gmail, YouTube, Maps and Google+ Hangouts are integrated and just a click away. And since it’s based on Chrome OS, the Pixel boots up in seconds and never slows down, requires almost zero setup or maintenance, and comes with built-in virus protection. Best of all, it stays up to date with automatic updates every few weeks. 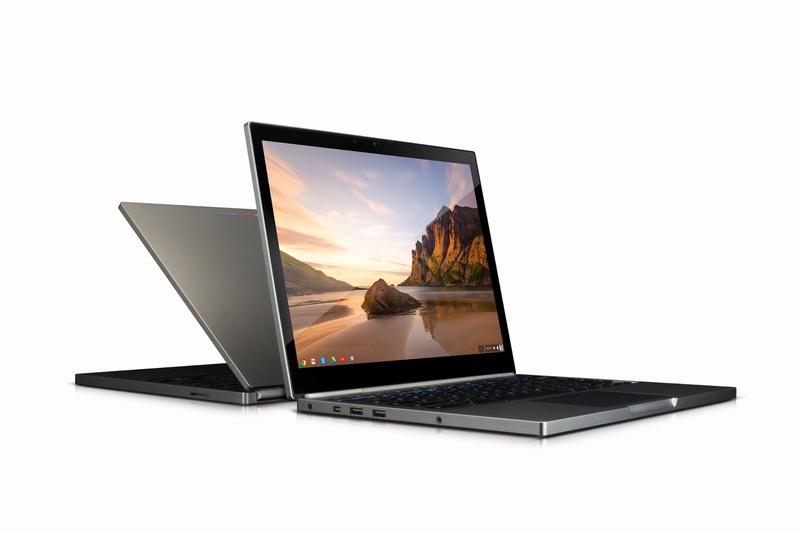 If you want to be part of the next step in the Chromebook journey, the Pixel will be available for purchase starting today on Google Play in the U.S. and U.K., and soon on BestBuy.com. The WiFi version ($1,299 U.S. and £1,049 U.K.) will start shipping next week and the LTE version ($1,449) will ship in the U.S. in April. If you’re interested in a hands-on experience, you can visit select Best Buy (U.S.) and Currys PC World (U.K.) store locations. It’s one of the most exciting times in the history of personal computing, thanks to a rapid pace of change, innovation and consumer adoption of devices. Our goal is to continue to push the experience forward for everyone, working with the entire ecosystem to build the next generation of Chrome OS devices. We hope you enjoy what’s next. *You will have 1 TB of free storage for 3 years, starting on the date you redeem the offer on eligible Chrome devices. Chromebooks were designed to make computing speedy, simple and secure. For many of you, they have become the perfect, additional (and yes, affordable) computer: ideal for catching up on emails, sharing documents and chatting via Hangouts. We’re tremendously grateful to our partners—Samsung, Acer, Lenovo and HP—for their commitment. The momentum has been remarkable: the Samsung Chromebook has been #1 on Amazon’s bestseller list for laptops every day since it launched 125 days ago in the U.S., and Chromebooks now represent more than 10 percent of notebook sales at Currys PC World, the largest electronics retailer in the U.K.